It’s a great time to be a nostalgic retro gamer with countless ways to replay all the 8 and 16-bit games you loved as a kid—assuming you are a Nintendo fan. The NES and SNES Classic Editions, as well as several third-party console clones that work with original carts, do a lovely job of putting retro Nintendo games on a modern TV, but things aren’t so rosy on the Sega side. Awful hardware has plagued nostalgia-starved Sega fans for years—but that all changes today. Analogue’s new Mega Sg doesn’t just do retro Sega gaming right—it does it almost flawlessly. 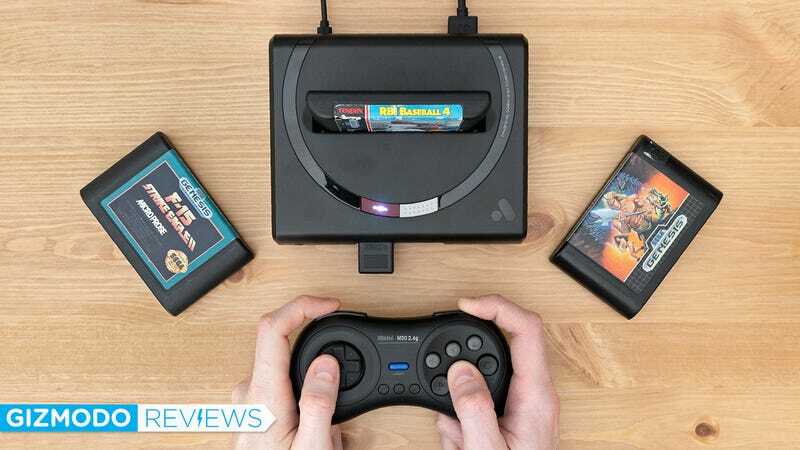 If you’ve ever had the chance to try out Analogue’s other console clones of the original NES or the Super Nintendo, or have just read our past reviews of either device, the Mega Sg won’t seem like it’s breaking new ground—but that’s definitely not a bad thing. When cloning a classic console, there are a few approaches you can take. You can buy up loads of old hardware and simply transplant their guts into a new housing, but that’s time-consuming and risky without a reliable stockpile. You can also attempt to manufacture old processors and chips again, but that’s expensive. The most common solution is to use a software emulator running on an operating system that’s powering your console. It’s the cheapest option, but even the best emulators running on excellent hardware can’t perfectly replicate all the nuances of old gaming hardware. They can get close with many games, but it will never be flawless. So as we’ve seen with Sega throwback consoles like AT Games’ $80 Sega Genesis Flashback, that approach, coupled with less-than-impressive hardware, results in stuttered gameplay, laggy controller response, and, as has been the case with a lot of retro Sega hardware; abysmal sound performance. The Mega Sg is available in a black or white finish, but the version we tested best mimics the look of Sega’s old hardware. We tested three Genesis games with the Mega Sg, including MicroProse’s F-15 Strike Eagle II, Sega’s Golden Axe, and Tengen’s RBI Baseball 4. Bonus points are awarded to Analogue for the Mega Sg’s thin, power bar-friendly adapter, which connects to the console with a micro-USB connector. The Mega Sg is nearly identical in size to Analogue’s Super Nt, and side-by-side the pair are still smaller than modern consoles like the Xbox One and PS4. These adapters aren’t the most elegant solution to accommodating cartridges of various sizes, but they do help keep the Mega Sg’s footprint small. To accommodate these various cartridges the Mega Sg relies on adapters that snap into its single cartridge slot. The Master System adapter is included, while the others are still en route and will need to be purchased separately. It’s not the most elegant solution to the problem as requiring users to keep track of multiple adapters is one of the worst gadget sins, but it does help keep the Mega Sg’s footprint small so it can easily squeeze into your entertainment center. To use wireless controllers with the Mega Sg, like the 2.4GHz version of 8BitDo’s M30, you’ll need to attach this dongle, which is another adapter you won’t want to lose (but probably still will). The Bluetooth and 2.4GHz versions of the 8BitDo M30 Sega Genesis controller are nearly identical, although the convenience and flexibility of a Bluetooth connection will cost you about $5 more. The Bluetooth version also requires another $20 adapter to work with the Mega Sg. I also have a small complaint with the Mega Sg’s controllers. The front of the console includes two ports allowing you to connect the same tethered gamepads you played with decades ago. Sure, it adds to the authenticity for those who are retro gaming sticklers, but anyone splurging for a luxury console like this is going to want to go wireless. Analogue and 8BitDo offer two solutions for this: a $25 2.4GHz version of the Genesis’ original controller which includes an adapter, or a $30 Bluetooth version of the same controller which requires a $20 adapter to make it compatible. Both are flawless recreations of the original gamepad, but each one, unfortunately, requires an ugly dongle (or two of them) to hang off the front of the console. I understand that it helps keep the price down on an already premium retro console, but I’d really like to have seen wireless connectivity built right in this time around. 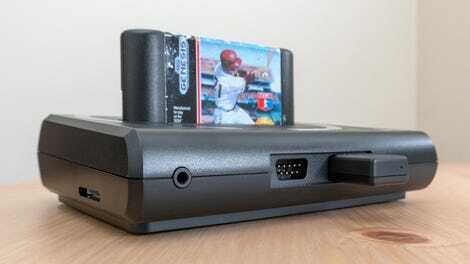 In my later years, I’ve become obsessed with 16-bit baseball games, and the Mega Sg delivered the best RBI Baseball 4 experiences I’ve ever had. The Mega Sg includes a copy of the never-before-released ‘90s DICE game Ultacore!, which is your typical side-scrolling, run and gun affair. The Mega Sg’s default UI is sparse, yet still oozes with retro, pixelated charm. But head into the “settings” menu and you could get lost for hours customizing how your games look. If you prefer the look of games on an old CRT TV, the Mega Sg can overlay fake scanlines configured exactly how you want. Among the many, many customization options in the Mega Sg’s “settings” menus is the ability to tweak the gamma (brightness) on a per color basis, so you can really make Sonic the Hedgehog pop. No hardware design will ever be perfect for every user; we all have our own preferences and tastes. But on the software side, I can’t see anyone having any complaints with how the Mega Sg performs. (Aside from monsters who want to artificially up-res their content.) Games look absolutely beautiful and play rock solid on modern TVs, and you’ll even be tempted to crank the soundtrack on some of them. (Aladdin comes to mind.) As with Analogue’s previous consoles, there’s an in-depth “settings” menu that feels almost intimidating once you start to dig down into all the options. Everything from tweaking colors, to adding artificial CRT-like scanlines, to even changing how quickly the Mega Sg boots up can be modified to your liking. It’s hard to believe anyone would ever have to ask, “why can’t I...?” when it comes to tweaking the Mega Sg. You’ll just want to keep in mind that, at least out of the box, the Mega SG is a BYOC (bring your own cartridge) affair. You can hit up your parents’ basement or local flea markets to stockpile Sega carts again. But if you’re patient and aren’t intimidated by custom firmware, as with the Super Nt, the Mega Sg will eventually be able to play ROMs through its SD card slot. Analogue doesn’t lock down its hardware as rigorously as Nintendo does, so it won’t take long for developers to “jailbreak” the console. With a $190 price tag that doesn’t include a controller, I’m not going to pretend that the Mega Sg is cheap. It isn’t. It’s a premium product. If you tend to focus on Nintendo titles when it comes to retro gaming, there are certainly cheaper and adequate alternatives to what Analogue offers. But if you’re a Sega fan, you’ve undoubtedly been disappointed with the options out there. You deserve better, and it doesn’t get any better than the Mega Sg. Flawless retro Sega gaming thanks to a custom-chip that emulates the original hardware perfectly. Plays games from every pre-Dreamcast Sega console, including the Game Gear, if you’ve got the right cartridge adapter. Includes one game, but for the time being you’ll need to bring your own cartridges until custom firmware facilitates loading ROMs. Supports old-school wired Sega controllers, but requires dongles to connect a wireless alternative. It’s not cheap at $190, but Sega fans who’ve been constantly let down by console clones won’t be disappointed with this one.